This is a moment and a post I have been waiting to share for a long, long time! No, I didn’t actually eat a cricket. At least not one with intact legs, head and crunchy exoskeleton. Have you heard of Exo? If you surf the web as much as me, you’re almost bound to have seen an ad or an article about the up-and-coming nutrition brand whose main ingredient is cricket flour. Yes, crickets! Believe it or not, insects are still a primary food group for people in around 80% of the world’s nations. Popularity in the West has dwindled (for obviously cultural reasons – eek) and now hardly anyone utilizes this taboo, yet protein-rich food source. “Wow factor” aside, using insects as a primary protein source is a great idea, since as a crop, they are much more viable than traditional livestock in terms of impact on the environment. They require far less water and feed to raise than poultry, pork or cattle, not to mention much less space on the farm. Oh good! Only 40 CRICKETS per bar! Nbd.. I love trying new things, and try not to turn up my nose at cuisines and cultures I may not fully understand. 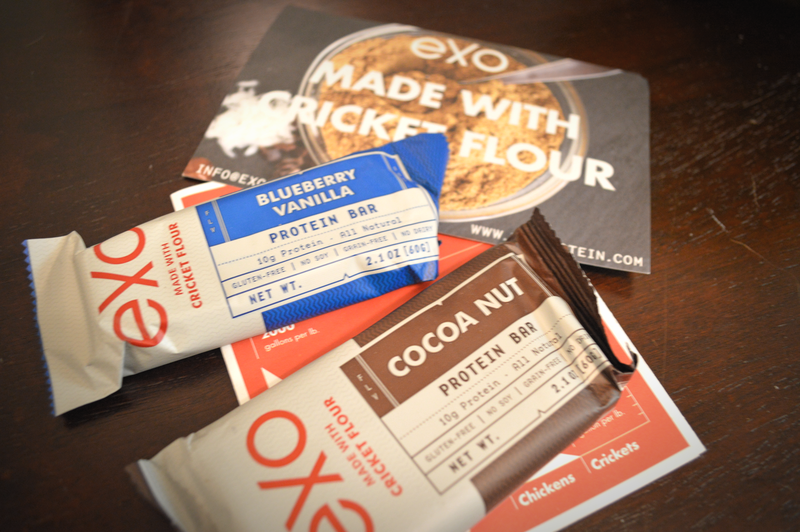 I contacted the brand directly because I absolutely had to know what a cricket protein bar tastes like. They were gracious enough to send me free samples of 2 of their different product flavors: Cocoa Nut and Blueberry Vanilla, and some cool literature outlining all the various benefits of crickets as a food source. As for the taste? It’s really not half bad! I tried Cocoa Nut flavor and immediately hit with that “protein” flavor – but not any worse than other protein bars. A little dry, but had rich chocolatey flavor. Then I started noticing the crunchabits I was biting down on..must have been the cricket flour! Definitely a trip when I realized it, but didn’t affect the flavor for me. Next I tried Blueberry Vanilla and was much more pleased; this bar actually had some moisture to it and was sweet enough to mask the slightly meaty flavor of the cricket flour. Each bar had 10 grams of protein! With around 40 crickets per bar I guess that makes sense. These bars are gluten- and dairy-free sources of protein that are efficiently sourced, and good for the environment too. You really can’t go wrong! I will probably end up ordering more of the blueberry flavor from their website for myself and my boyfriend to try out. 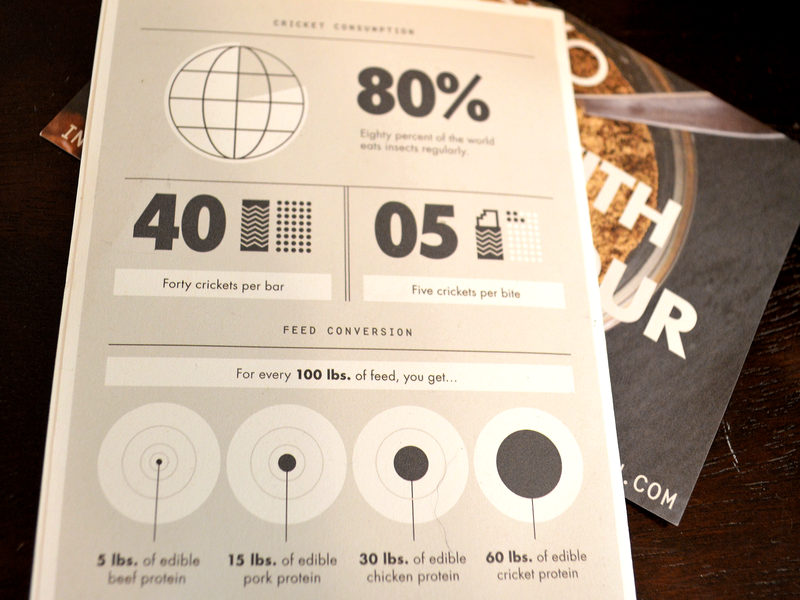 Could eating crickets actually solve the meat crisis, or world hunger? Mbe! But for now you can get a taste for yourself and see how you like it as part of your active lifestyle, thanks to Exo. The company was also kind enough to provide me with a 25% off promo code for all of my readers! Punch in RAWNSTET at checkout and get some delicious crickets for yourself! Thinking About Getting A Vape Pen? Quality Matters! Click to follow the hurt guru and receive notifications of all new posts via email.